Although it is quite common to find small patches S.alveolata along Europe's exposed shores, they rarely exceed 10cm in height or cover more than a few tens of cm². There are cases however where the biogenic reef can take on the form of a raised hummock or platform, which completely covers the underlying substrate, and reaches more than 65 cm in height. 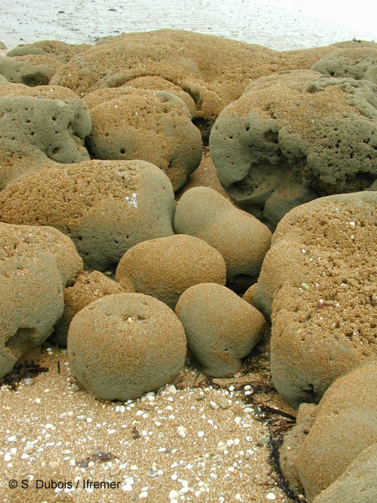 Exceptional reef growth on hetereogeneous substrate. See the cobbles underlying the reef which acted as support. An analysis of the condition needed for these biogenic structures to develop shows that a high-energy environment (i.e. wave exposure and/or strong currents) is always needed. This is the case for example in Duckpool, Cornwall (UK), where the rocky substrate is exposed to strong wave action (Wilson, 1974). A certain degree of wave action is required in order to suspend particulates into the water column for food and tube construction. Very occasionally, honeycomb worm reefs can form on sedimentary substrata that has been stabilised sufficiently (e.g. by Lanice conchilega). Efforts must be made with terminology: what constitues a honeycomb worm "reef"? Whilst it is clear that just a few scattered tubes do not make a reef, what are the vertical (height/thickness) and horizontal (surface/density) parameters needed for the biogenic structure to be considered as a reef? Biogenic reef dynamics are complex but can be summed up in different stages. The first stage is the successful primary settlement of larvae onto either conspecific reef structures, shell fragments or rocky substrate, where the adult S. alveolata can begin to build their tubes. When several, initially horizontal, tubes converge, their growth becomes vertical, with each organism using its neighbour's tube as support to grow upwards. 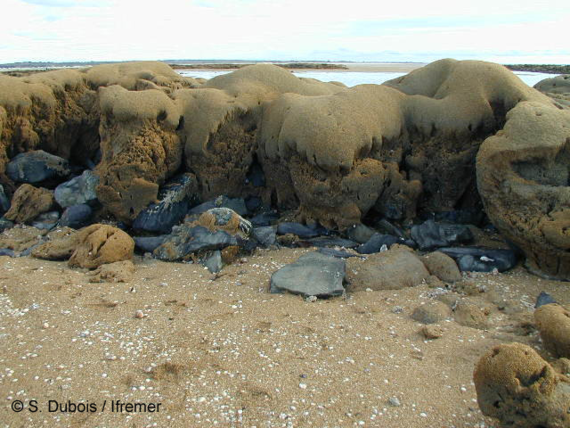 The clustering together of an important number of tubes leads to the formation of veneers (on rocky shores) and hummocks (on heterogeneous shores where suitable substrate is a minority). These hummocks can then fuse together to create large raised structures, more than 65cm in height, known as platforms. These platforms represent the healthiest stage stage on the biogenic reef cycle. A honeycomb worm reef section showing different dynamic stages. In the foreground are the hummocks which are starting to fuse together. In the background, the reef platform.